Lectures, group discussions and hands-on explanations of antiques and fine art. Hands up for hands on! If you have the hankering to know more about antiques, or you simply want to know what it’s like to hold a fortune in your fingers, book now for your place in a series of workshops that let you get a grip on your subject of choice. Each seminar is $40, which includes a glass of wine and is is limited to 10-20 people, so everyone gets a go at increasing their expertise. To be sure of your place in this year’s workshops book now! Better still, book five sessions and get the sixth for free. Enter the code SIXTHFREE at checkout. 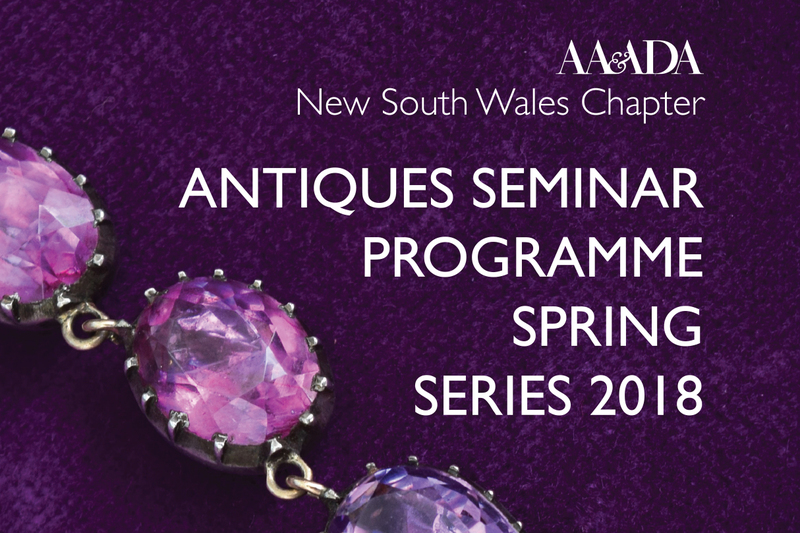 Every Thursday in Spring from October through to November, a member of the New South Wales Chapter of the Australian Antique and Art Dealers Association hosts a seminar on a specialist subject at their premises. That way you learn the same way the experts do, by having and holding. Let the years recede and the past come alive in these practical sessions open to anyone interested in art, ceramics, jewellery, furniture and silver. In just 90 minutes, insiders’ insights will help you be that little more discerning if you want to be a better collector.